Independent FAA testing of a lithium battery fire, AmSafe Bridport accepts the challenge. After the successful fire tests completed last year by AmSafe Bridport, the FAA conducted independent testing of the available fire protection products in the market, to test the manufacturers claims that their products would indeed provide protection from a fire containing lithium batteries. AmSafe Bridport were pleased to support these tests and provided their recently developed Fire Containment Overpack Bag, a Fire Containment Bag (FCB) specifically designed for the safe transportation of dangerous goods under IATA recommended packaging requirements. The Fire Containment Overpack Bag clearly demonstrated its capabilities, as when loaded with 200 lithium ion batteries, it successfully contained the fire, with all batteries destroyed. The requirement was then increased with a load of 1000 batteries, 80% filling the bag. Over the four hour test all batteries experienced thermal runaway and the fire remained contained, therefore passing the FAA test criteria. This testing follows 10 years of development of AmSafe Bridport’s Fire Containment Cover designed for protection against undeclared dangerous goods on a full ULD pallet position. The testing completed for the undeclared risk provided AmSafe Bridport with the confidence to develop the Overpack Bag for the specific threat posed by lithium battery shipments. 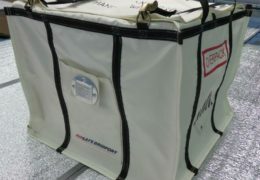 The Fire Containment Overpack Bag can be tailor-made to required sizes and available to order immediately.